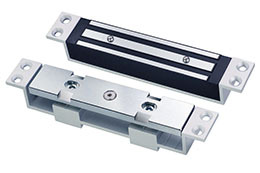 ¡ô 1200KG(2400Lbs) static linear holding force. ¡ô Can Set free 12VDC . ¡ô Built-in reverse current protection device (MOV). ¡ô Anti residual magnetism design, anti-wear manufacturing materials. ¡ô Shell is made of high-strength aluminum alloy, Anodized. ¡ô Increase the holding Force,Dual Insulative Hosing. ¡ô MA certified products of China / CE certification of EU. ¡ô Complete electromagnetic suction work, there is no mechanical failure.